We believe that the most innovative designs are both functional and beautiful, and that a piece is only complete when its performance is as smart and satisfying as its appearance. This flexible design pairs warm, architecturally inspired wood louvers with a cool, satin-tempered glass top and durable steel base. The perfect media cabinet for medium-sized home theater systems, packed with user-friendly features. 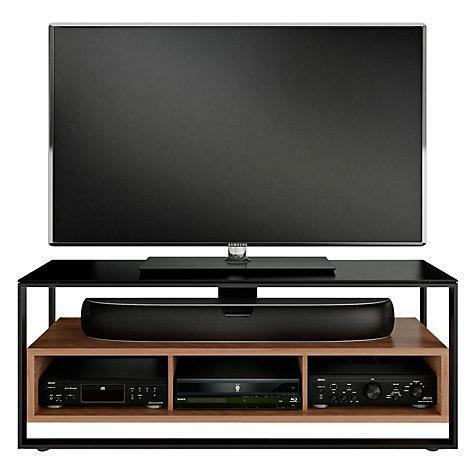 Combining the best elements of open and closed systems, the Sonda TV stand offers convenient access with an enclosed feel. The open shelf can host a soundbar, centre channel speaker or several components. The lower cabinet appears to float within the black steel frame and includes a removable back panel for easy access to the rear of three component compartments. Sonda is finished with a tempered, black micro-etched glass top.